Neuroplasticity exist in the older brain, too. But it works differently than in young brains. It was long thought that brains of young people are very flexible and plastic while those of older people largely lack this plasticity. This thinking has changed a lot over the last thirty years, Much more is known about the capability of brains to keep changing, even at an advanced age. Some amazing examples of neuroplasticity can be seen here and here. If it is indeed true that brains of older people remain plastic, that would be good news. It would mean that we can keep on making progress throughout our lives. And there are many indications that this is indeed the case. As I wrote here: "While it is undeniably true that some functions will start to decline from a certain age, some other functions may get stronger well into old age. For instance, as we age, most of us get better at emotion regulation and we tend to get a more positive and optimistic outlook on life. Also, it appears that we become better at pattern recognition and at making better judgments due to our tacit knowledge (more about this)." Neuroscience is a fascinating subject and discoveries about the brain and neuroplasticity keep emerging. It is now known, for example, that in adult brains, new neurons are constantly produced (Shors, 2014), something which, not too long ago, was held impossible. This process is called neurogenesis. These new neurons can be retained by effortful learning. Without that, they will die within a few weeks. Another relatively new discovery is that neurons are not the only brain elements which play an important role in learning. They are, of course, extremely important. When we learn, new connections between neurons are established and certain existing neuronal pathways are strengthened while others fade. But apart from these structural changes in the brain, there is another type of structural change which is also essential and which has to do with white matter in the brain. White matter consists of glia cells and myelinated axons. Myelin is a greasy substance which gives white matter its white color and which is wrapped around axons a bit like plastic is wrapped around an electric cable. Myelin functions as an insulator which speeds up the transmission of electric signals through neurons. Research has shown that by effortful practice, so-called deliberate practice, neurons become more myelinated. The layer of myelin wrapped around the axon becomes thicker which enables faster transmission of impulses. A new study by Yotsumoto et al. (2014) shows another new and interesting thing. Young and old participants of the study had to learn a visual task. Older participants, were, on average, as able as younger participants to do this. By MRI scans revealed that learning the task led to different changes in the brain in old and young people. In young people learning the task mainly led to changes in the grey matter of the brain, the neurons. In old people, however, learning the task mainly led to changes in white matter. In young people new connections were established; in old people more myelin was produced. Although the path to learning appears to have been different, the result was the same: both groups learned the skill (read more). When you read this you might suspect that people who keep on learning throughout their live have more white matter in their brain than people who don't when they reach the end of their live. And this is what seems to be the case. 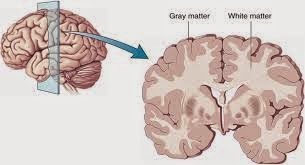 When the brain of Albert Einstein, who until the end of his life kept trying to develop a theory which would connect his own theory of relativity with quantum theory, was studied after he died, it turned out to contain much more white matter than 'normal' people's brains.